Years earlier Mel drops out of university due to an unplanned pregnancy and gives birth to a son, Liam. Several years later she marries Ben and they have two daughters together. Ben raises Liam as his own and family life, although somewhat dull, is happy and settled. That is until Mel receives an unexpected email from old university pal Abi, who's been living the celebrity lifestyle in L.A. with hubby Rob. Abi's caught Rob cheating and they're now embroiled in an acrimonious divorce. On the pretext of escaping the drama and publicity, Abi contacts Mel to ask if she can visit. What better place to get away than back in the UK with her old friend. Mel readily agrees - it'll be nice to see Abi again and who knows, maybe her celebrity status will add a bit of zest to her own life. But Abi has an ulterior motive... one that will shake Mel's family to its core. 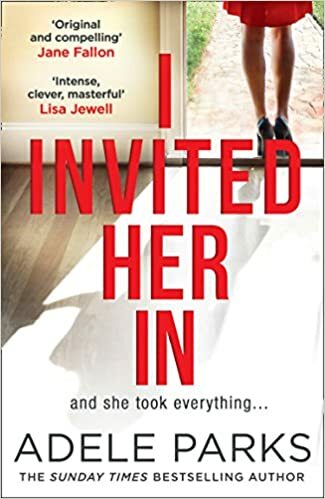 I really enjoyed I Invited Her In, my first book by Adele Parks. It was an easy read but one which had me gripped right from the start. It tells the story of a long hidden secret that resurfaces years later to destroy everything Mel holds dear. How can a friendship go so terribly wrong? It's told not only from the perspectives of the main characters but also those on the periphery; giving the reader an in-depth insight into each person's viewpoint. This was incredibly successful and resulted in my allegiance shifting several times. You begin to question who really IS the victim in all of this. The complete picture is conveyed through the diverse outlooks, making it a multi-faceted and intriguing story. In my opinion it's a first class book from an adept and gifted author. *My thanks to Adele Parks, NetGalley and HQ for providing a copy of this book. I’ve always dreamed of being a writer and my first novel - Playing Away - was published in 2000; that year the Evening Standard identified me as one of London’s ‘Twenty Faces to Watch’, which was very nice of them! I like to keep busy and I’ve published seventeen novels in seventeen years, and I'm thrilled to say that they've all hit the bestseller lists. I've sold over three million books in the UK alone and I've been translated into 26 different languages. I have written 15 contemporary novels and two historical ones, Spare Brides and If You Go Away, which are set during and after WW1. My latest novels, The Stranger in My Home, The Image of You and I invited Her In are twisty, domestic noirs. I like to scrutinize our concepts of family, our theories on love, parenting and fidelity. Whatever period I set my novels I’m known for examining the thorny issues of the lives people lead with my trademark, up-front, tell-it-as-it-is style. I passionately believe that reading is a basic right. I'm a keen supporter of The National Literacy Trust and a proud Ambassador of The Reading Agency's Six Book Challenge, a scheme that encourages emerging adult readers who are becoming passionate about books. In 2008 I wrote a Quick Read, Happy Families as part of the celebrations of World Book Day, which went on to win Quick Read Learners’ Favourite Award, as voted for by the public. In 2017 I was awarded the Romantic Novelists Association Outstanding Achievement Award.